March 19 — Have you discovered a surprising fact about one of your female ancestors? What was it and how did you learn it? How did you feel when you found out? Blog prompt from Lisa Alzo. March 19, 1840 is the day my 41-year-old great, great grandmother Elizabeth Tipper laid charges against her attacker. Her attacker was a 5’7” dark-complected man who physically attacked and threatened her life. March 19, 2015 marks 175 years since that day. The harsh reality of discovering this information was a shock; I had no idea of the horrors that her and her children went through. You see her attacker was her husband. Domestic violence is in my family tree. Elizabeth & Robert Jeffrey married in St. Andrew’s Church, on February 2, 1818 in Quebec City. Robert was a Scottish immigrant to Canada, a stone mason by trade. Children started arriving soon after, first a son John and then daughter Mary both born in Montreal. Mary died the following year, but children continued to arrive until Elizabeth had given birth to nine, with six surviving infancy. Being a Mason, Robert and his family went where there was work, Montreal back to Quebec City and in 1832, St. Etienne de Beauce. Robert signed a contract to build a mill for George Pozer. This answers the question, as to where my great grandmother received her name Hannah Pozer Jeffrey. With the building finished the family travelled back to Quebec City. The evening of March 19th, 1840 was the last straw for Elizabeth. She took a step that she had avoided till now and went to the police filing a complaint. Was my great grandmother Hannah a witness to this? My daughter Jordan is eight, the same age Hannah was when the events unfolded. Did Hannah hear her dad say to her mom, “…death was waiting for her…” How many times had Hannah heard that? What else had she witnessed her father do? Not being the first time that he had attacked her mother. According to the police report her father had “been in the frequent habit of beating and ill-using…” her mother. Forgiveness granted, as is so often the case in domestic violence situations. Elizabeth is hoping that Robert is a changed man, and that bringing the charges against him worked, that he won’t do it again. She reconciled with Robert and their last child Julia Heathfield Jeffrey arrives in 1842. The story is not over though, Robert doesn’t change, things do not go well for Elizabeth. Less than a year later she had him arrested again, and he served a month in prison this time. Elizabeth finally stopped forgiving Robert, in the 1851 census she is living with her daughter Elizabeth in Quebec City, and Robert is gone. Elizabeth passes away two years later at the age of 54 “after a lingering illness of eight months, which she bore with becoming resignation”. Elizabeth (Tipper) Jeffrey, may be one of my most Fearless Female. 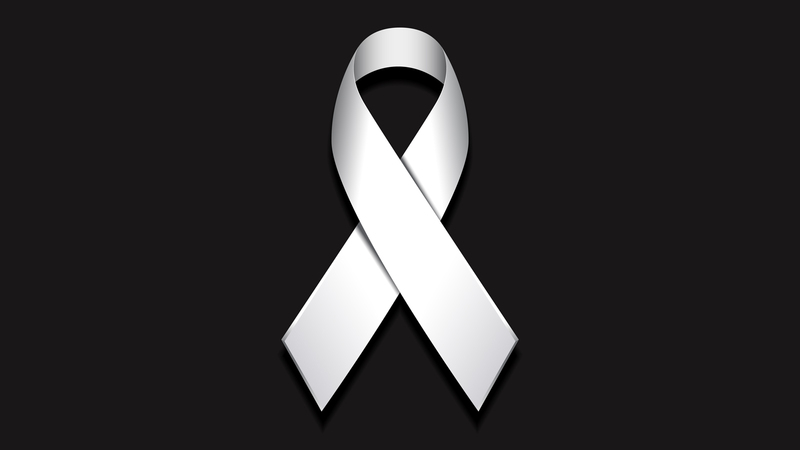 This white ribbon is for her. *I am very thankful to Elizabeth LaPointe for researching the prison records and to the BanQ Quebec Archives for their on-line databases but in this case specifically for Inmates in the Prison of Quebec 19th century.